Welcome to the Job Markets Australia online database, 2018-2019 issue. The online database remains the standard and largest source of well-researched, systematic information on occupational labour markets in Australia. 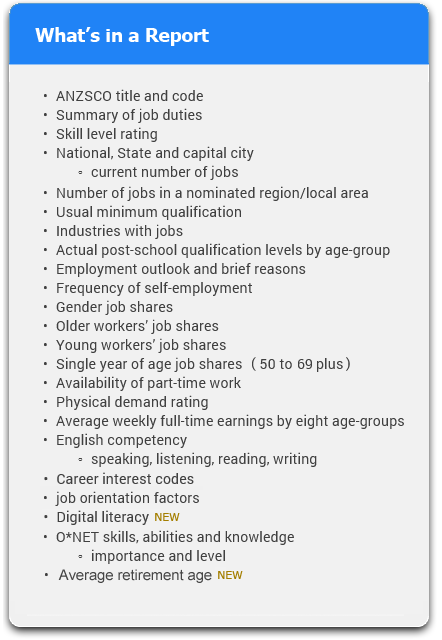 It provides a wealth of statistical, evaluative and reference data for over 1,000 occupations. Most importantly, the methodology ensures that the earnings statistics are reliable measures of market-rate income by age and occupation and that the other statistics reflect best practice principles in occupational research. The powerful Query functions lets you search on 15 information fields, alone or in combination. This identifies immediately which occupations meet your search criteria. The content and sources are explained in the Information Paper found in Sources on the toolbar. Also on the Sources page is a paper titled, Some free earnings figures, which looks at a number of free data sources on earnings. It’s $12 for each Job in the Report. Is there a tax invoice? Yes, when you pay by PayPal the name and address details held for the PayPal account are included in a tax invoice with the amount paid. It will have all necessary information for Yorkcross Pty Ltd, the company operating this website. Check FAQs in the Toolbar for answers to other popular questions. In a few easy steps you can have your occupational Report. To get started Click the Create Report button above. Type in the full or part title of the occupation/s of interest, and click Find Job/s. Then tick the right boxes and click Add Job/s. Use the Query function to search for suitable occupations, and then follow the same steps as for the Find function.